The Visitacion Valley Green Nodes project is one of eight Early Implementation Projects that will be constructed in San Francisco’s urban watersheds as part of the San Francisco Public Utility Commission’s (SFPUC) Sewer System Improvement Program. 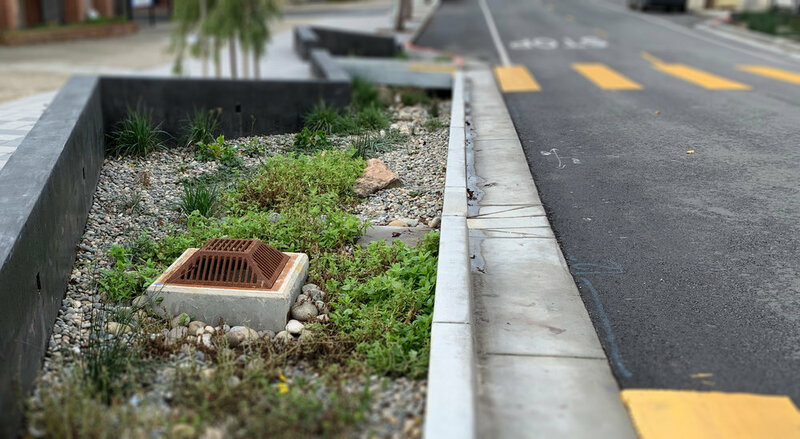 The project, currently in the design phase, implements green stormwater infrastructure at two community designations within the disadvantaged neighborhood of Visitacion Valley. The Leland Avenue Rain Garden site, at the edge of McLaren Park, creates a large 3,000 square foot terraced rain garden facility that manages stormwater from the adjacent Visitacion Avenue. The vegetated bioretention planters will capture, store, and infiltrate runoff from the impervious roadway into the underlying native sandy soils. This Green Node will also provide community benefits by creating an accessible entrance to the adjoining community garden, creating a pedestrian connection to the greater McLaren Park. The second node, the Sunnydale Mini-Plaza, consists of large midblock and corner bulbouts containing bioretention planters at a busy T-intersection near a large church and school. The bulbout planters provide traffic calming and pedestrian safety while removing stormwater from the combined sewer system. Permeable pavers within the sidewalk zone will provide additional stormwater management while improving the health of existing and new street trees. Integrated landscape elements and planting will help to convert a wide expanse of concrete pavement into a pleasant and safer community space for the neighborhood. As the lead engineer, Lotus Water led the technical analysis efforts during the planning stage that evaluated opportunities and constraints throughout the watershed and eventually determined the project site locations. Lotus Water collaborated with the consultant team, SFPUC, other city agencies, and community stakeholders to develop the preferred concept plan. During the design phase, Lotus Water has led the development of the detailed BMP designs and street improvement plans as well as the associated technical reports. The Visitacion Valley Green Nodes project is estimated to remove 0.8 million gallons of stormwater per year from the combined sewer system during a typical rainfall year and reduce the peak volumes by nearly 90% during the level-of-service storm. The project will serve as one of the first public green infrastructure projects constructed in the city of San Francisco and help inform future green infrastructure efforts within the city and the extended Bay Area.